Looks like the “I Will Follow You” man will extend his reach to the latest Microsoft smartphones, following the announcement of the exclusive bundle from the partnership between Microsoft and Digi. Did we mention? This will be the first time you’re seeing Continuum: a PC-like experience on your Lumia 950 or 950 XL via Display Dock and Windows 10 on any smartphone. The question is, will it change Microsoft’s success in the local market? 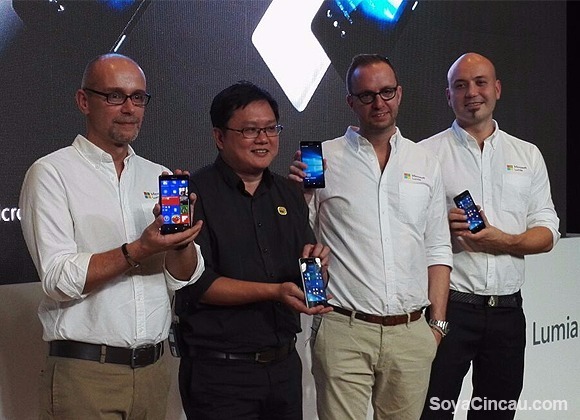 Let’s see if Digi enterprise/business customers take advantage of this special deal. The smaller of the two, the Lumia 950 will be absolutely free of charge though it’ll come with a hefty monthly fee of RM 238 on a 2 year (24 months) contract – working out to a huge RM 5,712 total. It isn’t just for the phone, as you’ll be getting 10GBs of mobile data, totally unlimited calls, text and instant messaging (WhatsApp and WeChat). If you’d prefer something bigger and more powerful, the Lumia 950 XL will be available too. You’ll get the same plan as talked about above, at the same monthly price, but you’ll have to fork out an additional RM 330 upfront for the smartphone itself; bringing you to an eventual RM 6,042 total cost. Given that spending RM 238 per month doesn’t sound as practical for someone who doesn’t use all that bundled data, calls/texts and instant messaging, you can bump that price down by choosing other Digi plans that will be announced on the 18th of December; mind you, the two smartphones’ will cost more, but you’ll be paying less monthly. 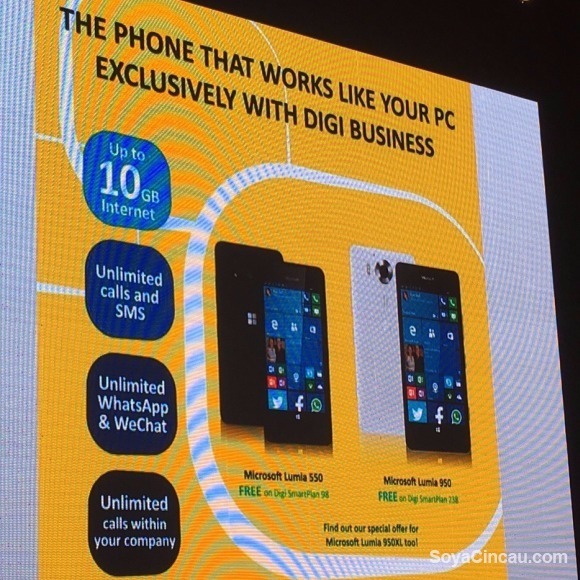 During the same announcement, Digi mentioned that this collaboration will bring about a third (more affordable) device, the Microsoft Lumia 550, that will be free on the Digi SmartPlan 98. It’ll be available slightly later, at the end of December of this year. Head on over to our announcement post for a full recap of what these Windows 10 devices have to offer, as well as their full specs.